Hydrostop’s innovative and durable PremiumCoat® roofing system is a perfect companion for the concrete based SCIP roofs of the Hi’ilani EcoHouse. The structure’s long life expectancy requires a roofing system on which additional layers can be added over time, without requiring replacement of the foundation layer. Hydrostop’s waterproofing system is applied to Hi’ilani’s roofs and the Tridipanel water storage tank, assuring long-term freedom from leaks. 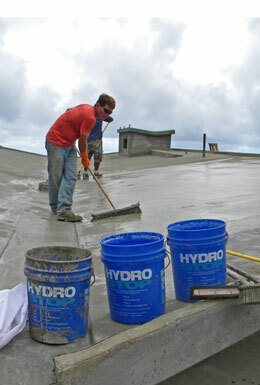 Hydrostop treated surfaces are certified safe for contact with drinking water. The roof system is economical and sustainable for the life of the building. The roofs will exceed the highest standards for hurricane force wind resistance and solar reflectivity, and will yield savings of thousands of dollars by reducing maintenance expense and energy consumption. PremiumCoat® sustainable roofing and waterproofing system is one of the highest quality roofing and waterproofing systems available. It is made of the best raw materials to form a flexible, U.V. resistant elastomeric compound and is fully reinforced with a tough nonwoven polyester fabric which has been designed for roofing and flashing applications of all types. PremiumCoat® is easy to apply, safe to work with and requires no special equipment. When the system is properly installed, by a certified applicator, a 10 year warranty is available for specific roofing applications. The warranty can then be extended every 10 years under a proper maintenance schedule.